ounded by Rob van Bommel, Sportscene specializes in straying from the norm—broadcasting, filming, and photographing the more unusual sports activities, such as canoeing, kite surfing, and surf life saving, for corporate sponsors, athletes, PR agencies, organizing bodies, sports federations, and professional sports clubs around the world. 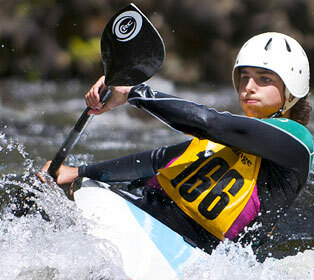 In 2009, Sportscene was commissioned by the International Canoe Federation (ICF) in Zurich to cover one such event: the Canoe Slalom World Championships in the Spanish Pyrenees. At the championships, Rob filmed the races, audience, and venue, in addition to interviewing athletes and coaches throughout each day. He shot the event in what he terms “commando style,” utilizing a roving camera that shoots in native QuickTime® and uses SDHC memory cards. 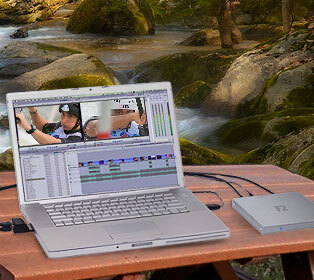 At the end of each day, he edited the footage on location in Final Cut Pro® using his 17-inch MacBook® Pro. The final result was a daily video news flash, which was uploaded on YouTube® and made available to broadcasters across the world via satellite. With his past experiences in mind, Rob sought out a different solution for the Canoe Slalom World Championships. He needed a compact and rugged storage unit that was also extremely fast, could be configured in mirror mode, and didn’t require an external power adaptor. There was only one high-end solution in the Australian market that combined all the features Rob required: Sonnet’s Fusion™ F2 portable 2-drive RAID SATA storage system. The F2 is a rugged, compact device measuring about six inches on each side with a ¾-inch profile. It fits easily in a backpack, making it great for travel and provides flexibility in the field. It features two 500GB drives that can be configured in mirror mode to protect Rob’s footage and eliminate the need to back up on the laptop. The F2 connects to a laptop through an eSATA controller card such as Sonnet’s Tempo™ SATA Pro ExpressCard/34. Because of its fast eSATA interface, even with the drives mirrored, its read and write transfer speeds are faster than the internal drive on his MacBook. And it draws power from a FireWire port for a truly portable operation — Rob just connects it to his laptop and it’s good to go. For Rob, purchasing the F2 was an easy choice, and the unit turned out to be the perfect solution for his work in the Spanish Pyrenees. The F2 enabled him to create his daily video news flashes on location with a minimum amount of equipment, and ICF was quite pleased with the results. To learn more about Rob van Bommel, visit www.robvanbommel.com. With events organized across the world, ICF is one of my most important clients. With the F2 in my toolkit, they can send me everywhere for coverage instead of trying to find a producer in each different country. The F2 suits my storage workflow perfectly and for at least the next five years I can keep using it without the need to look for alternatives.